Announcing larger cross-section Wide Footprint Kalsi Seals - Kalsi Engineering, Inc. Wide Footprint Seals™ were designed to be directly interchangeable with the 0.335″ cross-section Standard Kalsi Seals that had originally been developed for use as rotary steerable tool and mud motor seals. With the enhanced durability resulting from a 50% wider dynamic lip and 0.010″ (38%) more radial compression than the older seal style, they quickly displaced oilfield sales of the older style seals. Subsequent improvements included a more efficient zigzag-based hydrodynamic inlet and other refinements. 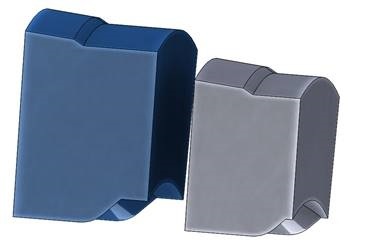 Now, for the sealed bearing mud motor and rotary steerable assemblies that have sufficient bearing housing radial thickness, we offer a larger cross-section Wide Footprint Seal, which is illustrated below. Typically made in a 0.425″ radial cross-section and used with a 0.382″ radial gland depth, this larger seal design has the same percent compression as the original Wide Footprint Seal, but 0.007″ (19.4%) more dimensional compression — a total of 65% more than the original Standard Kalsi Seal. This increased compression helps the seal withstand the runout and wear encountered in abrasive service applications like mud motors and rotary steerable tools. The increased area and diameter of the static lip also helps to reduce circumferential slippage. Contact Kalsi Engineering for more information, including quotes for additional sizes of this new advancement in rotary shaft seals. The larger cross-section Wide Footprint seal (left), compared to the original 0.345″ cross-section. The larger seal provides a 19.4% increase in dimensional compression, without increasing the percentage of compression. This helps the seal withstand runout and wear.